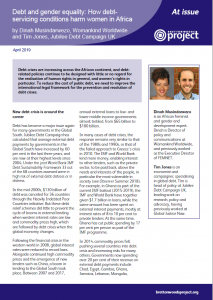 Debt crises are increasing across the African continent, and debt-related policies continue to be designed with little or no regard for the realisation of human rights in general, and women’s rights in particular. To reduce the cost of public debt, we need to improve the international legal framework for the prevention and resolution of debt crises. Debt has become a major issue again for many governments in the Global South. Jubilee Debt Campaign has calculated that average external debt payments by governments in the Global South have increased by 60 per cent in the last three years, and are now at their highest levels since 2004. Under the joint World Bank-IMF Debt Sustainability Framework 33 out of the 68 countries assessed were in high risk of external debt distress or in distress. In the mid-2000s, $130 billion of debt was cancelled for 36 countries through the Heavily Indebted Poor Countries initiative. But these debt relief schemes did little to prevent the cycle of booms in external lending when western interest rates are low and commodity prices high, which are followed by debt crises when the global economy changes. Following the financial crisis in the western world in 2008, global interest rates were reduced to record lows. Alongside continued high commodity prices and the emergence of new lenders such as China, a boom in lending to the Global South took place. Between 2007 and 2017, annual external loans to low- and lower-middle income governments almost trebled, from $65 billion to $180 billion. In many cases of debt crises, the response remains very similar to that of the 1980s and 1990s, or that of the failed approach to Greece’s crisis in 2010. 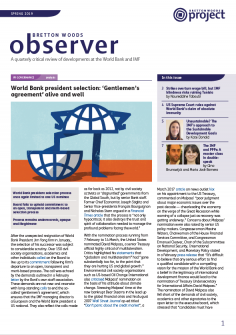 The IMF and World Bank lend more money, enabling interest to other lenders, such as the private sector, to be paid back, above the needs and interests of the people, in particular the most vulnerable in society (see Observer Summer 2018). For example, in Ghana as part of the current IMF bailout (2015-2019), the IMF and World Bank have together given $1.7 billion in loans, while the same amount has been spent on external interest payments, mostly at interest rates of 8 to 10 per cent, to private lenders. At the same time, Ghana has cut public spending by 17 per cent per person as part of the IMF programme. In 2014, commodity prices fell, pushing several countries into debt crisis and increasing risks for many others. Governments now spending over 20 per cent of their revenue on external debt payments include Chad, Egypt, Gambia, Ghana, Jamaica, Lebanon, Mongolia, Mozambique, Sri Lanka and Tunisia (see Observer Spring 2019, Summer 2018). There is often missing or sparse information about government debt. For example, the London branches of Credit Suisse and VTB Capital gave $2 billion to state-owned companies in Mozambique in 2013. Most of the loans were secret, and only came to light in 2016. None of the loans were authorised by the Mozambique parliament. Civil society campaigners in Mozambique are calling for further loans to be declared illegal and not repaid. Another way in which information around debt can be non-transparent is the exclusion of the voices of citizens and civil society organisations (CSOs), marginalised groups and women’s rights organisations and movements in the decision-making process. This exclusion matters, as decisions about debt payment fail to consider the disproportionate adverse consequences on the lives and rights of women in particular. Indeed, debt policies, just like all macroeconomic policies, are designed with little or no regard for the realisation of human rights in general, and women’s rights in particular. The closest macroeconomic policies have come to considering women’s human rights is through the rhetoric of women’s economic empowerment, which often takes an instrumental approach that focuses on how inclusion of women in the economy will increase economic growth, rather than questioning how they will support women to realise their rights (see Observer Winter 2017). Securing and payment of debt typically comes with various macroeconomic policy conditions from creditors to borrowers – commonly including measures pushing governments to reduce expenditures in critical social investments and public services (see Observer Spring 2018). Such measures often include cuts to social protection, health, care, and gender-based violence prevention and response services. Reduction of expenditures in these sectors and services has a disproportionate impact on women who are the majority of users of these services and disproportionately work in these sectors due to existing inequalities that determine gender roles and responsibilities, while undervaluing their contribution. Eurodad research from 2018 found that IMF programmes in 2016 and 2017 have predominantly pushed for austerity in 23 out of 26 borrowing countries. Government expenditure is subsequently cut in areas such as care, health services, such as sexual and reproductive health and rights, and care responsibilities, such as taking care of the sick, the elderly, and home schooling of children, which predominately fall on women. In providing care – whether paid or unpaid – women face multiple and intersecting forms of discrimination based on age, race, income levels, ability and disability, gender identity and sexual orientation. A 2018 report by the UN Independent Expert on Foreign Debt and Human Rights notes that women in poor households spend more of their time performing unpaid care work than women in non-poor households (see Observer Winter 2018). In addition, young women and elderly women predominantly do low-paid care work, including domestic workers. Cutting care services in the face or high debt servicing costs therefore can directly and disproportionately impact women’s lives. We see evidence of cuts in services that are vital to women’s lives in cases like Mozambique, now facing a major debt crisis, where Human Rights Watch documented the government failing to investigate cases of domestic violence. In trying to reduce expenditures, governments make decisions to downsize wages, retrench and make redundancies, further corroding women’s opportunities to expand and build social networks, gain skills and confidence. Women, being disproportionately employed in civil service, and segregated in the lowest, most vulnerable positions, are often the first ones to lose their jobs. Also indirectly, women can have different experiences to men in the process of wage bill reductions, as demonstrated in a case in Mozambique, where a woman became ostracised and reliant on suitors after her father’s public hospital job was cut. Inordinately high pressure to service debt places pressure on countries to increase revenues, often through increasing indirect tax such as VAT, which is regressive and carries a disproportionate impact on women. Organisations such as Womankind Worldwide, FEMNET and AWID have called for progressive and gender transformative tax policies, which will contribute to narrowing inequalities between the Global North and South, as well as supporting countries in the Global South to raise maximum available resources for the purpose of meeting their human rights obligations in accordance with various national, regional and global human rights instruments. We must reform the global financial system and end the dominance of lenders in setting the rules, leading to a reduction in the level of debt servicing demanded and the creation of favourable terms for borrowing and debt relief. One key crisis prevention step is to increase transparency of lending and borrowing, so that parliaments, media and civil society – including women’s rights organisations – can hold governments to account for how borrowed money is used. Borrowers and lenders should commit to reporting all loans on a publicly available database within 30 days of contracts being signed. To incentivise transparency from lenders, all major financial centres should pass a requirement that, for loans to be enforceable, they have to have been publicly declared when they were given. A measure to both prevent crises and help resolve them would be to stop bailing out reckless lenders when crises arise. Bailout loans just serve to lengthen the crisis, while creating a moral hazard where lenders can act recklessly, knowing they will be paid off anyway. When unsustainable debts arise, lenders should be required to restructure debts, rather than be bailed out. One way to encourage this to happen is for IMF loans (and World Bank general budget support loans) to only be given to debt crisis countries if: i) a restructuring will happen as part of a lending programme, which will get the debt down to a sustainable level, or ii) a government defaults on debts, so that IMF money is not used to pay off previous lenders. Set out clear IMF rules on the points above so as to increase the pressure on lenders to accept necessary debt restructurings. This would free up money to finance development, helping governments to meet their human rights obligations, and would mean that lenders would be more likely to act more responsibly in future. 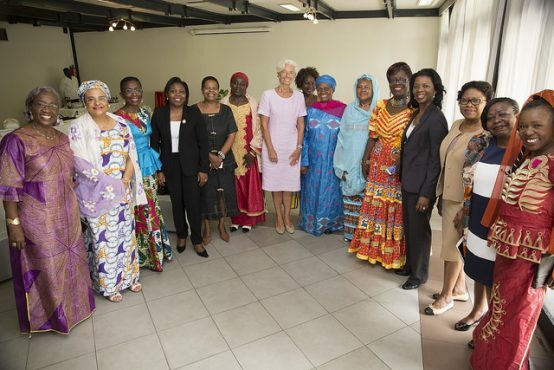 We need to ensure that new borrowing is invested in areas that promote gender equality and women’s rights by using comprehensive gender-budgeting tools on both sides of the fiscal coin. We need to also ensure an analysis of the extent to which debt-servicing burdens undermine a government’s abilities to meet its obligations to fulfilling women’s rights (see Observer Spring 2019). Ensure the burden of debt servicing and loan conditionality does not fall disproportionately on marginalised women. As the previously mentioned GADN briefing recommends, “Systematic inclusion by international financial institutions and national governments of human rights impact assessments—including a specific focus on the impact on the rights of women and girls—in the assessment of a country’s debt sustainability and design of loan conditionality. Review of any cuts in public expenditure, or increases in tax revenue, as a result of debt servicing to ensure the burden does not fall disproportionately on women.” Gender impact assessments should be carried out prior to borrowing and after the implementation of a programme to assess the extent to which the programmes contributed to the needs and interests all women, especially marginalised women and girls. An international, legally binding framework should be put in place to hold corporations and banks accountable to human rights. The international community, and countries in the Global North, should support the proposed UN Binding Treaty on Transnational Corporations. Finally, debt policy needs to be evaluated and restructured in the light of the human rights principles of maximum available resources and the progressive realisation of women’s human rights. Dinah Musindarwezo is an African feminist and gender and development expert. Dinah is director of policy and communications at Womankind Worldwide, and previously worked as the Executive Director of FEMNET. Tim Jones is an economist and campaigner, specialising in global debt. Tim is head of policy at Jubilee Debt Campaign UK, leading work on research, policy and advocacy, having previously worked at Global Justice Now.